The EMOW USB charger from Kanger is designed specifically to handle your charging needs of your Kanger EMOW battery. With an input Voltage of 5v and an output Voltage of 4.2v 500mA, it has all the power you need. The USB feature makes charging your EMOW battery anywhere a breeze. 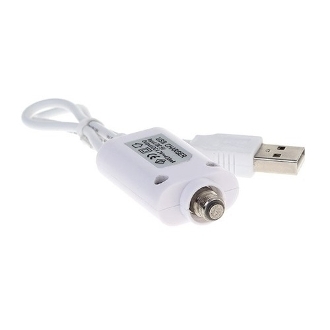 Plug it into any usb port, such as on your computer or in your car, and you are good to go. NOTE: This charger is made exclusively for the Kanger EMOW battery and should be the only charger used to charge your EMOW battery. Using another charger may/will cause irreparable damage to the battery and will void the warranty. Screw your battery onto the charger port. Plug charger into a USB port on your computer or your wall charger. NOTE: The light on the charger will turn RED while the battery is charging. When the light turns GREEN, this means the battery is finished charging and should be removed from the charger immediately. Please Note: Charging the e cigarette batteries over night may cause battery failure due to overcharging.